It's very cliched to say that Christmas has snuck up very quickly on us this year, but I cannot believe it's already Christmas eve!! Thankfully all my Christmas shopping has been done and mostly wrapped and the decorations are up so that's the bulk of my tasks done. But what a week I've had - put in three days at the office, did a gestational diabetes test (negative woo hoo! 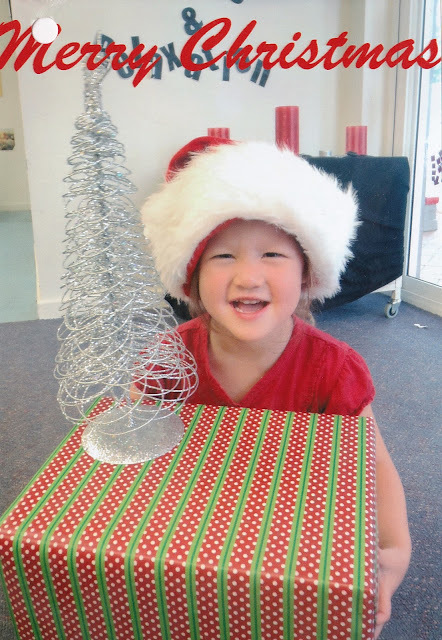 ), hosted a party with our neighbours at our house, went to carols by candlelight, braved some late night shopping, babysat four kids for a few hours with a friend while we tried to get them to sit for a nice group photo (exhausting and fruitless) and cleaned my house (including my sewing room) from top to bottom. No wonder I feel about 90 years old at the moment! Of course I didn't get everything done that I had on my to do list. My swimmers are about 75% done, all that I need are some straps and to sew the leg elastic on, but apart from that they look pretty awesome. I did think about saving the fabric for post pregnancy, but I think I've bought enough fabric to make a maternity swimsuit as well as a normal sized one - swimsuits really do use up so little fabric. Hopefully I can squeeze in some sewing time tonight after an overexcited little girl goes to bed. After Vicki commented on the last post that Snapfish were having a 50% off sale on their calenders after she had bought one at 40% off without free postage I spent ages uploading photos and ordered 4 calenders by the cut off date for guaranteed pre Christmas delivery. Well here we are on Christmas eve and they are nowhere to be seen, but I guess I should have paid for the express post option and not just settled for the free standard shipping. Vicki I hope your calendar turned up in time - it will make up for not getting that extra 10% off and free shipping! Better late than never right? I also slaved away over a gingerbread house, seriously it was so fiddly to construct and decorate that I decided halfway through that I would probably not make another one of these again, and then when the kids I was looking after managed to destroy it in 2 minutes and eat most of it in 30 minutes I definitely decided not to make one again! I also wisely decided not to sew any Christmas presents this year because I knew I would only stress myself out and not finish them anyway. But I did make some cabbage patch doll clothes of all things for a doll I'm giving Anna for Christmas. It's actually my childhood cabbage doll that I've cleaned up and am gifting to her - possibly cheap, but I like to think it's nostalgic and sentimental. I seemed to have kept the doll (and my sister still has her identical twin doll too), but for some reason the clothes have gone missing. I also spray painted an old cane basket I had in a red gloss paint to store all the clothes in. Far out sewing those little bitty clothes are fiddly, but it's a good use of fabric scraps. It's also really hard to find cabbage doll patterns - Butterick have stopped selling them, there are no free patterns on the web and the ones for sale on ebay are exorbitant. 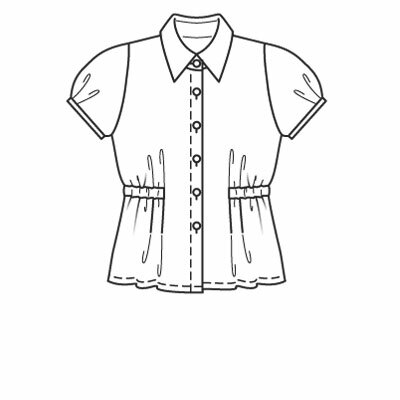 I bought one pattern for a shirt and jumper dress, but I ended up drafting a pattern for a simple a-line dress, pants and a skirt. And that it is it for my crafty adventures for this year. I doubt I'll have time to sew or post again between now and our annual trip to the inlaws, let me say now thank you all for following along with my adventures this year and sharing your own too in your comments and on your own blogs - I really love being part of our sewing community. I hope you all have a happy and calm Christmas and new year. Darwin residents - I hope the cyclone doesn't eventuate, and Christchurch residents my fingers are crossed that your ground stops shaking for the next few days at least. The alternative title to this post, to use a good old Aussie phrase, is well that would be bloody right! About a month or so ago I found myself driving to the airport to pick up the husband and was a bit too early due to some unheard of light traffic. The Remnant Fabric Warehouse happens to be on my route to the airport, so I stopped in to have a look at what they had on offer. They had such a great range of swimwear fabric for only $9.95/m that I had the crazy idea to make myself a maternity swimsuit. Mind you I've never made a swimsuit because if there's one garment you want well cut and well made to make sure it's flattering and that it won't fall apart on you while you're wearing it, it would be a swimsuit! And of course I've not made a maternity swimsuit either, but I figure if I could avoid paying $150+ for a maternity swimsuit that I would only use for the next three months then it would be worth a try. Pretty fabric, right? I also picked up some skin coloured lining, swimsuit elastic and some sew in bra cups, all for a good price since the prices at the Remnant Warehouse are generally pretty good. Only I got an email from them last week informing me that they're having a 25% off everything sale! Since I haven't cut out the fabric yet, I could have just waited a little bit and saved 25% (or more likely bought 25% more fabric instead). Don't you hate it when you have poor timing? There are hardly any swimsuit patterns available, but amazingly Kwik Sew had quite a few patterns to select from, but I thought this one would be the easiest to adapt for maternity given it has a seam under the bust line. 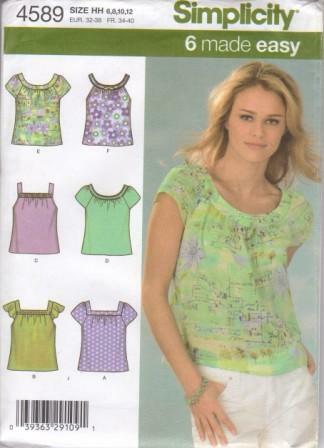 So with the 20% off and an extra 10% from my VIP membership I paid about $13 for this pattern (yes Kwik Sew patterns are very expensive in Australia). And in another coincidence in poor timing last week they sent out their latest catalogue advertising 50% off all patterns, and helpfully enclosing a 15% off voucher to boot! 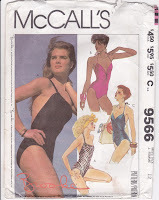 And then a few days ago I popped into an op shop and found not one, but two swimsuit patterns for the grand total of $1.... Sure they are 1980s style, but with a little modification they could be modernised: McCalls 9089 and McCalls 9566, both long out of print. So after all of these grrrrrrr moments, I thought I had better get started on that swimsuit. I'm happy to say that my test swimsuit made from some lycra I had in the stash has actually turned out quite well so I'm thinking I might just be able to do this successfully after all. But the final annoying moment? 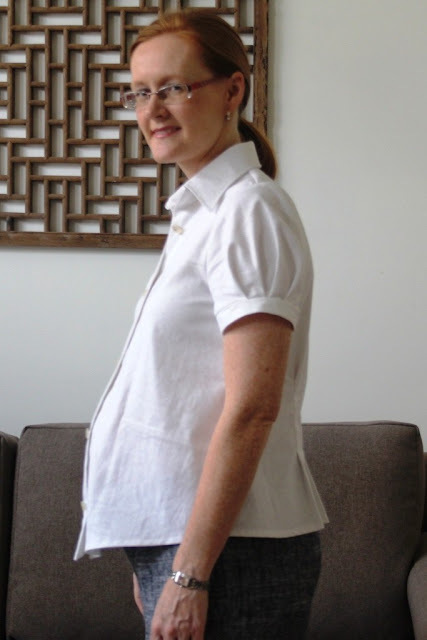 Queen Bee maternity currently has a sale on maternity swimwear (with free postage in Australia), and I bought a tankini in solid blue for $54 marked down from $128!!! Oh well, I'm sure I could use two swimsuits given I have a beach holiday coming up soon and just in case mine turns out ordinary. learning from my mistakes......and then some! Ha ha I crack myself up sometimes! I suppose I could re-hem the front and shorten it slightly so that the dip at the front is not so exaggerated, but that would mean adding something else to my extremely long to do list so I think I shall live with it. In answer to Dib's question posted in the comments to the last post about whether I'm only modifying Burda patterns for maternity wear the answer is no - it only seems that way. I try to pick patterns that already have a hint of maternity about them so that it's not too difficult to modify them, and it just so happens that Burda have been specialising in patterns for loose flowing smock / potato sack styles that are ripe for modification! But the added benefit of Burda is that since I'm already tracing them out it's convenient to make the modifications to the pattern at the same time. 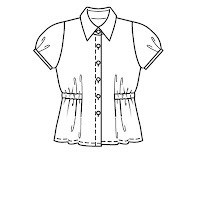 But for this blouse I used Simplicity 4589 because it was an easy style to modify given that it has no shape to it whatsoever. All I had to do to make it work was to increase the width of the front by about 10cm, and increase the amount of gathering under the yoke to accommodate that extra width. Actually I used a series of small pleats across the front because I think it looks neater than gathering. I also made a matching tie to wear with it because without cinching it in it has a bit of old fashioned smock look about it. I made this in a soft cotton which I recently purchased from Spotlight for no particular reason, so I was glad it didn't join the stash and instead got make into something quickly. The fabric though had huge potential for misplacement at the bustline (if you get my drift) but thankfully with the gathers across the front I shouldn't have that problem. Although this is comfortable to wear, looking at these photos I think I should have made the next size up across the bust because it looks a little tight under the arms. Clothes not fitting me at the bust is certainly not a problem I've had before! Perhaps widening the yoke would let the front fall more freely. In answer to the comments in the last post, Carol I think the reason the white shirt stayed clean is because I work it to work and didn't spend the day with Anna. As with all toddlers she is a major mess magnet and I usually get some fallout from her too! Gail I am hoping to wear this post maternity, I'm sure that by adding the pleats at the front and elastic casing around the waistline that it will be a flattering fit. And now to get on with the rest of my to do list - why is it christmas seems to come around more quickly every year? In every article that a fashion magazine runs on wardrobe essentials the basic white shirt is always included. 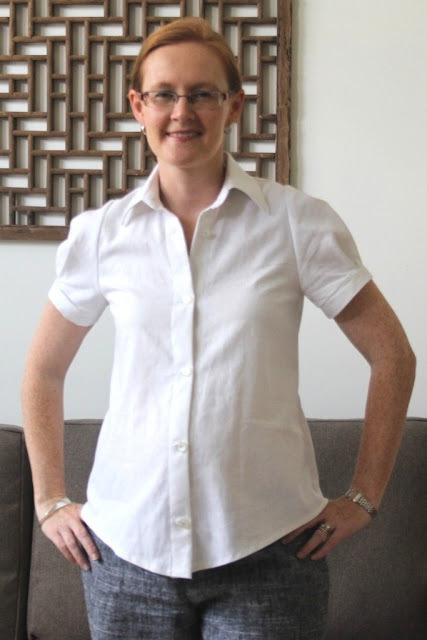 It's a bit ho hum boring, but I do admit a nice crisp white shirt is a versatile wardrobe builder that goes with loads of outfits in all sorts of occasions. And when you're preggers you need as much versatility as possibility, because you eventually get to a point where you'll wear anything anywhere as long as it fits! I wore this to work on Monday (with the grey pants from the last post) which is why it's looking a little wrinkled, but that's to be expected (and accepted) from linen. I left off the front gathers that I had put in the grey dress because this fabric was a little stiffer and so didn't drape as well but also because it doesn't look shapeless without them so I didn't bother. I like how the darts at the back give a nice fitted look whilst still having enough room for a comfortable fit. However I don't think I cut the front long enough to cover my bump for the entire pregnancy because looking at that side view it looks like it sticks out a bit. 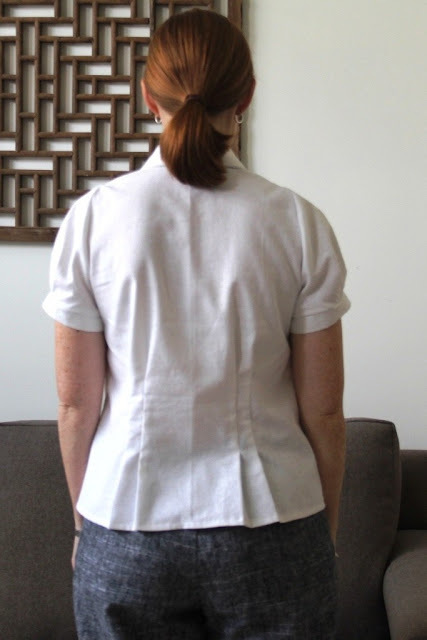 The shirt covers the bump nicely now and perhaps with high waisted skirts and pants it may work, so I shall see whether I need to make another one or not. Thank you for the lovely comments on the grey linen pants to the last post, they have proven very handy this week when our weather turned unexpectedly cold and these are pretty much the only pants I have that fit at the moment. I've grown out of my normal pants (for obvious reasons) and out of my maternity jeans (due to expansion of my rear not the bump embarrassingly) but I'm also not big enough yet for the other maternity pants I made last time around. I have already cut two pairs of shorts out using the same pattern although I might add some details like patch pockets or button tabs just to jazz them up a little. Speaking of cutting out, Shannie and Dibbs I'm fortunate enough to have a dedicated cutting table in my sewing room which has extra tall legs so that the surface height is just under my bent elbow so I don't have to bend at all although just standing for any short period of time these days is enough to give me a sore back. But I'm sure you both know plenty about that since you're both pretty much at the same stage as me. Connie (Grandma C) my official due date is March 30, although I'm taking that with a grain of salt given that Anna was two weeks late! So I'll be delivering at the beginning of our autumn which will be nice weather wise, but I'll still be in the third trimester during our summer. I should have learnt my lesson last time around because being heavily pregnant in summer was far from pleasant!